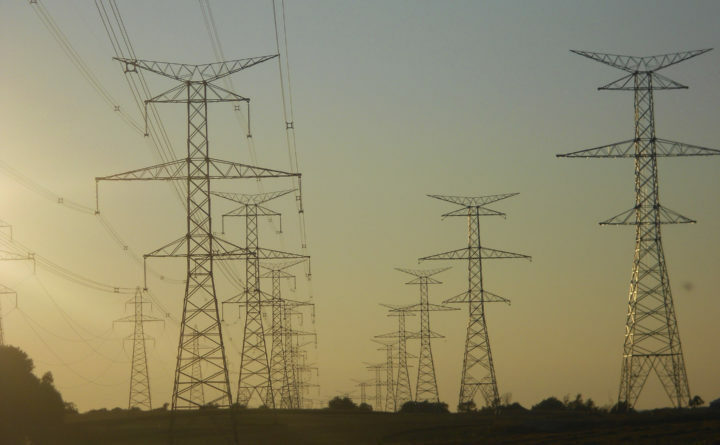 Transmission lines are shown north of Hanover, Ontario, Canada, in this 2011 file photo. New Hampshire's Site Evaluation Committee unanimously voted to deny a request by Eversource to rehear the $1.6 billion, 192-mile Northern Pass transmission line project that would deliver power from Canada to Massachusetts. Earlier this year, Massachusetts said it plans to move toward an agreement with New England Clean Energy Connect, a hydropower project proposed by Central Maine Power Co.
CONCORD, N.H. — A New Hampshire panel has dealt another blow to a controversial hydro project, upholding on Thursday an earlier decision to deny a proposal over concerns that it would have hurt tourism and businesses in the state. The Site Evaluation Committee unanimously voted to deny a request by Eversource to rehear the $1.6 billion, 192-mile Northern Pass transmission line project. It first voted against the project in February, which resulted in Massachusetts abandoning plans to contract with the project to fulfill its clean energy needs. “They believed that they did not misconceive or overlook any relevant evidence in the record,” committee Chairman Martin Honigberg said of members after the voice vote. The committee spent the day debating Eversource’s arguments for rehearing the case, including that it had overlooked positive aspects of the projects or that its failure to complete its deliberations the first time around violated its own regulations. Members argued that Eversource had been too quick to dismiss the negative impacts, done too little to work with municipalities in the northern part of the state to come up with a solution to local concerns and that it hadn’t provided enough evidence to show how it would alleviate the negative impacts. Ahead of Thursday’s hearing, Eversource said it is offering up to $300 million in reductions to low-income and business customers in the state. It also offered to allocate $95 million from a previously announced $200 million community fund — $25 million to compensate for declining property values, $25 million for economic development and $25 million to promote tourism in affected areas. Another $20 million would fund energy efficiency programs. After the vote, Eversource said it will continue fighting to build the project. Among its options would be appealing the ruling to the state Supreme Court. Opponents, dozens of whom were at the hearing and dressed in orange, said they were relieved but acknowledged the fight was not over. “Eversource failed to meet its burden of proof that the proposal would not have unreasonable adverse impacts on orderly development of the region,” said Jack Savage, a spokesman for the Society for the Protection of New Hampshire Forests, which opposes Northern Pass. In March, the Massachusetts Office of Energy and Environmental Affairs said it would reverse course and terminate the earlier selection of Eversource’s Northern Pass project. The state will instead move toward an agreement with New England Clean Energy Connect, a hydropower project proposed by Central Maine Power Co. Both projects would get their hydropower from Canada.